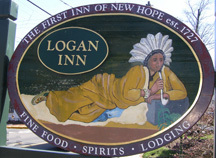 Bucks County, Pennsylvania is a treasure trove of historical properties, and the Logan Inn, located in the village of New Hope has proudly upheld the tradition of hospitality since it opened as a tavern in 1722. 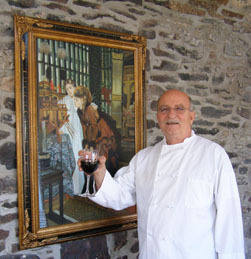 Chef/Owner Pete Gialias continues the tradition of hospitality with his approach of using the freshest of ingredients at the restaurant. 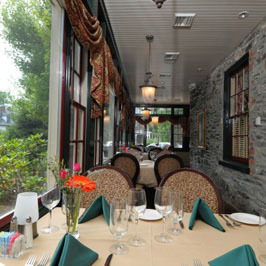 The Logan Inn opened as The Ferry Tavern in 1722 and as an inn in 1727. 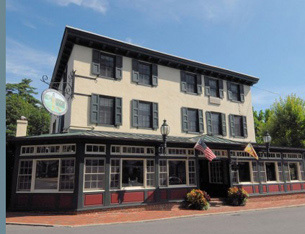 It holds the distinction of being the oldest building in New Hope, is the oldest continuously run inn in Bucks County, and is one of the five oldest in the United States. Having lunch at the restaurant in early April 2010, I felt as if Edward and I were experiencing a part of American history. 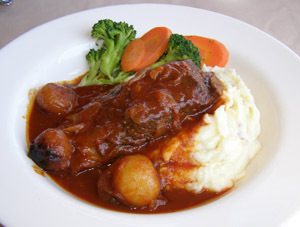 For lunch, Edward had the Braised Short Ribs served with mashed potatoes, boiled and braised white onions, sliced carrots, and broccoli crowns in a rich and hearty gravy. 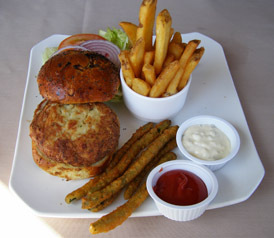 I had the Jumbo Lump Crab Cake Sandwich, which our server explained could be described as the restaurant's signature dish, that was served on a housemade onion roll accompanied with lettuce, tomatoes, Bermuda onions, a pickle spear, golden steak fries, and fried asparagus spears. When it comes to crab cakes, I deem myself a connoisseur who has a definite preference as to how I like them prepared; namely they should taste fresh, have balanced seasoning, there should be ample crab meat and not an overabundance of filler, should be delicately golden brown and not greasy. Chef Pete Gialias' version scored very high on my list of requirements; the crabmeat was succulent and plentiful with a fresh taste, was perfectly seasoned, delicately golden, and presented on a housemade onion roll. Add in crispy steak fries and the unusual, but very tasty, fried asparagus, and the marks got even higher. The asparagus were interesting with their crispy seasoned bread crumb coating, and after eating a few, felt that they should come with the label, may become habit forming; suffice to say, I fell in love with the fried asparagus. Read Chefs' Recipes where Chef Pete Gialias shares his classic Greek recipes for Lemon Olive Oil Sauce and Moussaka .